Your feedback is welcome. Thanks. These are some fun quotes, and it runs smooth. I don’t think you want to send #quotes to twitter. Actually I did, as an hashtag. I included it in the twitter api link. You can check it in the js section if you want. 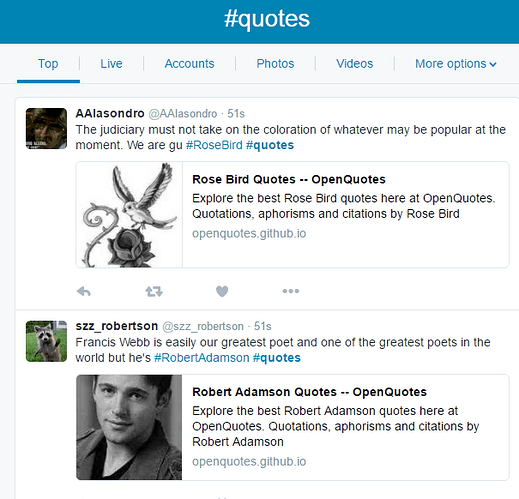 You are sending the words #quotes, when you only want to send the quote and author. Ok, that makes sense. Then you may need to add the actual url instead of hashtag. Allow easy discovery of Tweets by topic by including a comma-separated list of hashtag values without the preceding # character. A fully-qualified URL with a HTTP or HTTPS scheme, URL-encoded. The provided URL will be shortened with Twitter’s t.co to the number of characters specified by short_url_length. Oh, you meant on the website? I actually got the idea from the project example page. If you hover over the tweet button, you’ll see the link. I see what you are saying. I guess I’ve just never seen it before. User Story: I can click a button to show me a new random quote. User Story: I can press a button to tweet out a quote. Okay, then. It looks good. The quotes are good, and the tweet button works. Hey, you can’t tweet the first quote? I expected it would take me to the orginal url. That’s normal behaviour for a hashtag, I believe. you were transferred to your own twitter account. And from there, everything works like twitter should. I uh, used it as a placeholder, before users click the new quote button. I’ll see about fixing that Ben.